Meet the Nokia 6, Nokia 5 and Nokia 3, oh and did someone say 3310? Nokia is back. The Finnish brand is once again adorning smartphones and at MWC 2017 it took to the stage to reveal its first three devices: Nokia 6, Nokia 5 and Nokia 3. All three handsets boast highly affordable price tags and focus on delivering solid feature sets and stylish design for not a lot of money. Nokia has confirmed that the new Nokia 6, Nokia 5 and Nokia 3 will all go on sale globally in Q2 of this year. That means a new Nokia release date will fall sometime between April and June, but exact timings and locations will be revealed nearer to the time. The new Nokia 6 is the most feature packed of the firm's new trio, with a 5.5-inch full HD display, Snapdragon 430 chipset, 3GB of RAM, 32GB of internal storage, 16MP rear camera, 8MP front camera, fingerprint scanner and a 3,000mAh battery. It's not a flagship line up of specs, but when you consider the Nokia 6 price is just €229 (around $240, £195, AU$315) it looks like pretty good value for money. 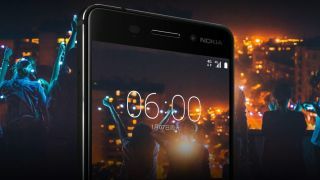 Nokia actually launched the 6 early this year in China to test the waters, and has now go ahead with its global rollout thanks to the positive reaction generated. On screen you'l find the stock version of Android 7 Nougat, the latest version of Google's operating system, without any interface overlay or pre-installed bloatware, giving you a clean workspace. If you're feeling fancier, there's a special edition variant of this handset - the Nokia 6 Arte Black - which features a glossy 'piano black' rear, 4GB of RAM and 64GB of internal storage for an asking price of €299 (around $315, £255, AU$410). The Nokia 5 sits in the middle of the new trio of phones, offering a more compact design over the slightly more premium Nokia 6, and a few extra features over the cheaper Nokia 3. It comes with a 5.2-inch HD display, Snapdragon 430 chipset, 2GB of RAM, 16GB of internal storage, 13MP rear camera, 8MP front camera, fingerprint scanner and a 3,000mAh battery. Last, but not least, is the baby of Nokia's new smartphone pack - the new Nokia 3 which sports an incredibly attractive price tag. There's a 5-inch HD display, MediaTek quad-core chipset, 2GB of RAM, 16GB of internal storage, 8MP rear camera, 8MP wide-angle front snapper and a 2,650mAh battery. There's no fingerprint scanner in play here, and it packs a cheaper chipset than the 5 and 6 so performance won't be as good - but at this price it can be forgiven. You still get the pure Android experience, a couple of acceptable cameras and a decent HD display, making the Nokia 3 a nice little budget buy.